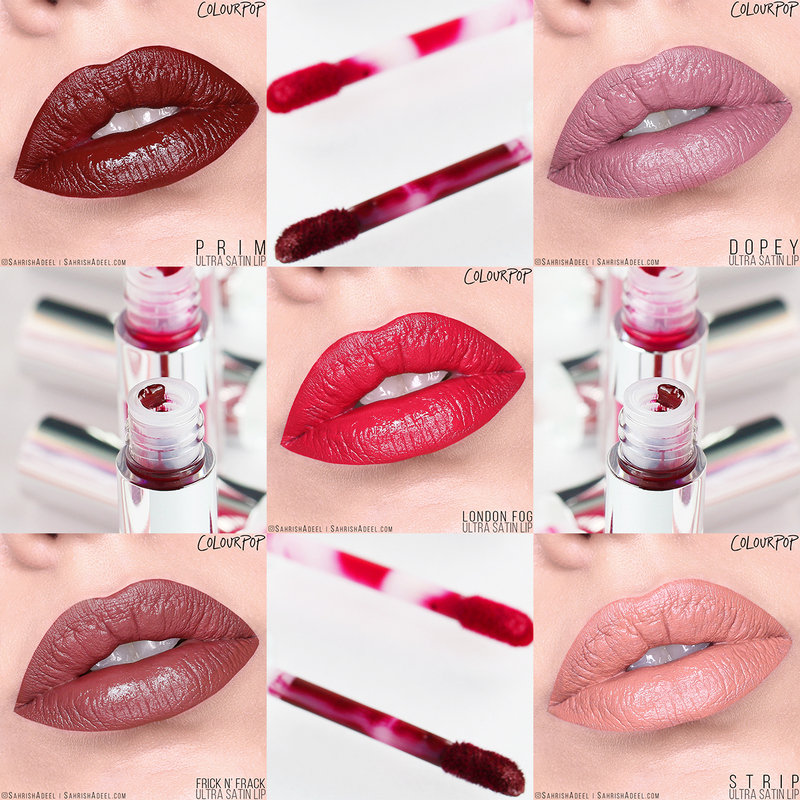 Ultra Satin Lips by ColourPop Cosmetics - Review, Arm & Lip Swatches | Sahrish Adeel - Malaysia based Pakistani Beauty & Lifestyle Blogger! If you are a reader of my blog and also follow me on my Instagram, you would know how much I adore ColourPop Cosmetics' products. Today I have five shades from their Ultra Satin Lip collection, reviewed and swatched on my arm and also on my lips. Enjoy reading! A creamy, bold lipstick with a satin finish. This formula has the same high percentage of pigments as an Ultra Matte Lip but contains emollient ingredients for added moisture, keeping lips looking fresh and feeling super comfortable. Though this lipstick is super long-wearing, it is not completely kiss-proof and does transfer. Net Weight 0.64g (0.023oz) for each mini & 3.2g (0.11oz) for each full size tube. Isododecane, Diisostearyl Malate, Oryza Sativa (Rice) Bran Wax, Hydrogenated Polyisobutene, C10-18 Triglycerides, Dimethicone Crosspolymer, Silica Silylate, Pentylene Glycol, Polyethylene, Disteardimonium Hectorite, Propylene Carbonate, Iron Oxides (Ci 77491, Ci 77492, Ci 77499), Red 7 Lake (Ci 15850), Red 27 Lake (Ci 45410), Titanium Dioxide (Ci 77891), Yellow 6 Lake (Ci 15985). Yes, these lipsticks are completely vegan and cruelty-free. It isn't too often that I can actually give my verdict in two lines about a product but with these Ultra Satin Lips, I actually can. Two-Liner: Each and every claim that ColourPop made for USL, is true according to my testing and trying for literally months. I could not be happier to own these babies. Now for a little more details in case you want to know! These are really moisturizing satin-matte finished liquid lipsticks with super high pigmentation and very smooth formula. They do transfer a little but keep the lips very comfortable. The wear time is pretty good but doesn't expect these to last through an oily meal unless you are one of those lucky people who know how not to mess up your lipstick, unlike me. Also, the applicator is easy to work with, I do like to keep a tiny bit of product on the brush when going around the lip line with darker shades but I really like the applicator. Overall, go ahead and buy these if you haven't already. I love all the shades I have but I will highly recommend that you get Dopey, Frick n' Frack and London Fog. Each full-size tube costs US$ 6.50 and mini sized come in a set of 5 for US$ 18. You can buy the collection from here [Official ColourPop Website]. What do you think of these Ultra Satin Lipsticks? Do you already own any shade? Let me know in the comments.